Describe a fully integrated system from natural gas input through to final products (Ammonia, Ammonium Nitrate, Urea, NPK etc.) including all processing and utility facilities. It is used to quantify the impact of key decisions based on production profiles and business options. Determine the optimum design of a facility and trade-off options in terms of capacity, in- process storage, built-in redundancy and equipment types that meets the project’s operability, production, cost and availability goals. Highlight the production criticality of systems and equipment and establish the individual availability requirements for sub systems and major equipment items, e.g. for the process system(s) and all critical utilities (instrument air, nitrogen, heating, cooling, venting system, power generation, etc.). Allow, during the operational phase, for the assessment of future proposed modifications, enable analysis of alternative maintenance and inspection strategies, highlight equipment requiring more detailed assessment, assist in spares analysis and near-term probabilistic production forecasting. Maintain the models live during the operating phase, which also has the benefit of calibration to actual results, enabling future models to be built with higher accuracy. It also permits lessons learnt to be fed back to future projects. Consider the impact on production of applying environmental policies, e.g. venting, and can also forecast probability emission volumes over the life of the asset due to equipment failures. All Major Projects shall develop and utilize a production availability model. In addition, Small Capital Projects should consider developing and utilizing a production availability model. Installed Production Capacity (IPC) of the system or systems being considered. The operations and maintenance strategy. Planned maintenance of the equipment. Other events that have potential impact on production, e.g. operator errors, SIMOPS, etc. Environmental policies and weather impacts. The data used in the model should be proven to be sensible and meaningful (utilizing OREDA or FIORDA data and case studies or other quality fertilizer industry reliability data sources). The complete production availability model should include a summary report stating assumptions, probabilistic production availabilities, ranked system or equipment criticality, with explanation of options explored through sensitivity analysis, opportunities identified and/or decisions made. A computerized probabilistic simulation technique that enables examination of the operability, availability, and mechanical reliability performance for a fully integrated production system. A volume-based analysis, i.e. amount of fertilizers that could be produced for a given design and time period. Individual subsystems such as production and processing facilities can be modelled separately if required. Extensive scheduled maintenance requiring unit(s) to be off-line. Lack of redundancy and / or over redundancy (e.g. whether a standby unit is necessary). Lack of capacity (e.g. benefit from 2 x 100% units instead of 2 x 60% units). Poor or degraded equipment performance (e.g. unreliability causing recurrent failures). Sporadic (catastrophic) faults (e.g. major compressor failure) if the data is available. Unacceptable levels of downtime due to resource delays (e.g. waiting on spares, crew, tools, etc.). Strategy variation (e.g. Operation, Maintenance, Repair, Spares). The earlier this knowledge becomes available in the design program, the easier and less costly the modifications is that either eliminates the problems or enable mitigations to be developed to reduce their impact. A production availability model highlights aspect of the design & operation where the most return can be gained by a suitable modification. As each change in the simulated operation is made and the output confirmed, the production availability process increasingly moves towards optimization of the overall facility. 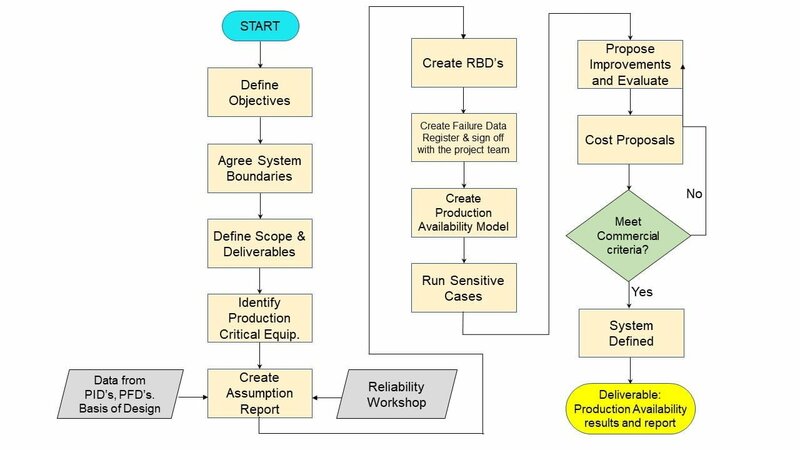 It is widely accepted that production availability modelling offers the greatest advantage at the outset of a project. 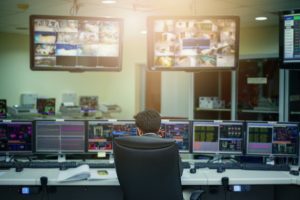 Production availability modelling can still be used during Operations but is generally focused on investigating the impact on overall facility productivity and safety resulting from specific equipment modifications (e.g. revamping of plant or change to maintenance strategy) or for strategic planning where the operating environment is expected to change significantly. It can also be used to perform short term probabilistic production forecasting, by starting with known current operating conditions (equipment available/ not available) and performing simulations on the random failures and any planned maintenance events. For projects and facility modifications, production availability modelling may be performed continuously with the level of analysis and modelling dependent on the level and quality of information available. Even though projects vary in size and complexity, study Major Projects common process (MPcp) requires that a model shall be developed in the Select Stage. Once constructed, the cost of refining the model and repeating simulations is relatively low. This low cost means that the exercise could be repeated as increased information becomes available to support design decisions. A simulation model tool (e.g. Monte Carlo) is recommended for Production Availability modelling. Production Availability modelling enables a discipline engineer or project team to rapidly build a computer simulation model of a proposed facility to efficiently evaluate different configuration and / or operating scenarios to arrive at the optimal design. This maximizes the value of a project by making better investment decisions via the trade-off of CAPEX (capital expenses), OPEX (operating expenses), and production availability, and thus provides better projects. Resource logistics and environmental influences. Equipment Failure & Repair Data (e.g. FIORDA, OREDA). Basis for Design Document. Process Flow Diagrams (PFDs) & Utility Flow Diagrams (UFDs). Schedules of Major Outages / Shutdowns including Weather & Spares Delays. Process & Instrumentation Diagrams (P&IDs) for process and critical utilities. Delays to restoring production to full capacity.